If there is one thing that businesses struggle with when it comes to social media it is usually what to post. 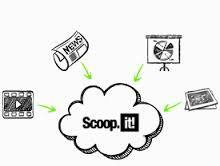 Scoop.it is a free online app which can help you find great quality content. The app will generate content depending on your interests and the tags you have used in your topic. To start using scoop.it all you need is a Facebook or Twitter account set up and ready to use, as the site will ask you to login with a choice of one of these two platforms. Once you’re all logged in you can start adding topics and things that interest you into your scoop.it. When you have added all of the topics you want the app will curate a huge list of articles that you can choose from to either tweet about, post on Facebook or on any of your social media platforms. You can either post is straight away using the app, or schedule it to go out at a later date. – Scoop it is an excellent app if you’re someone who doesn’t have much time to use social media due to having other priorities. – You can schedule tweets to go out throughout the week meaning you can spend an hour or so on a Monday scheduling useful and interesting articles to go out a couple of times a day for the week and not have to worry about it. – Easy to find good, solid content to share with your customers and followers. – Can post articles instantly from the app to all of your social media platforms with the option of adding your own comments. – The constant advertisements asking you to upgrade to the paid version of the online app can get a little bit annoying. – Cannot post to more than two social networking sites if you don’t have the paid version.